Good morning friends! Today's card features one of my favorite Thanksgiving dies from last year. It is the CottageCutz Autumn Centerpiece. There are lots of possibilities with this die. 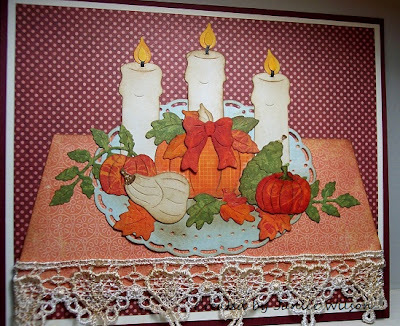 I also used the CottageCutz Oval Doily and Frame die as a platter for my table centerpiece. Here is my card. I used various papers and added shading with distress ink and Copics. Hope you like it! Have a wonderful day! This is absolutely beautiful Janice. So festive-I just love the candles and the way you arranged the pumpkins. Just awesome.